It's been awhile since I could use the table upstairs for anything other than piling the stuff I had cleared off the tables downstairs. 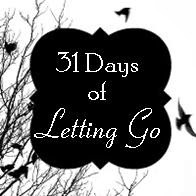 For a short while this afternoon I thought of quitting and giving up on my 31 Days of Letting Go. The morning had been spent with the run group and I was very much feeling the effects of the eleven miles I had put in the day before. A nap was a necessity, not a luxury so I took one. That didn't leave much of Saturday afternoon to devote to my project. I decided to follow the advice of Julie Morgenstern in Getting Organized from the Inside Out. First, she says, you need to decide how you are going to use the space and how you want it to look. The table upstairs is in the room we use as a den, the place where we go at the end of the day to watch TV and relax. I thought of how we use the den and how I wanted to use the table for something other than a catch all. I do mean catch all. The pile on the table that needed clearing included two Mary Englebreit engagement calendars, 3 travel magazines, 2 Oprah magazines, a notepad, 2 bookmarks, some glitter stickers, a newsletter with an article I thought would make a good devotional, some photos, a screw, a package of adhesive hooks (I think I bought them to hang Christmas lights), a CD, and more, unfortunately. Did I mention that the newsletter was from 2007? Houston, I have a problem. 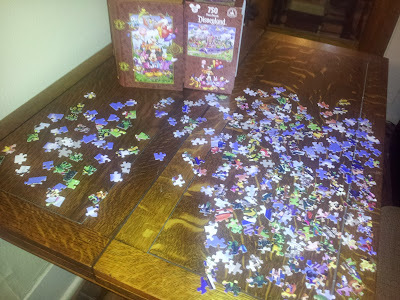 With eyes on the prize I tried to keep a picture in my mind of how I wanted to use the table that evening and decided that working on the new puzzle I brought home from Disneyland would be the perfect reward and motivation. I think working for a reward is going to be what keeps me at this. I'm catching up on these - I thought I had already subscribed! I reward myself for housework, too. An episode of "Parenthood", a glass of wine, or a nap. Motivation works...keep at it, girl. You will get there! Yes, you will.